Whte King. Can we take bleach out of a brand famous for bleach? Packaging for the White King new bleach free range. 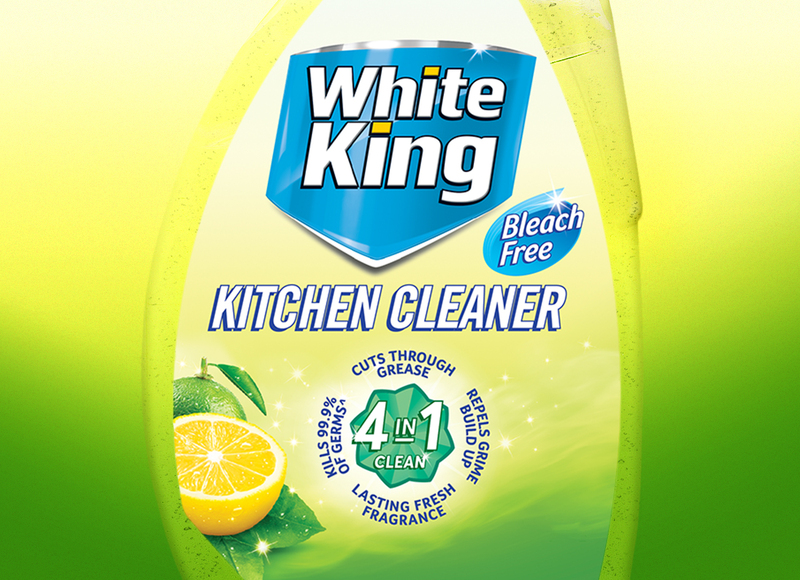 White King is an iconic Australian household cleaning brand. Originating in the 1950’s, it began as a liquid bleach but soon extended its range to include over 40 products across household cleaners, toilet cleaners and laundry but all including various levels of bleach. Pental (the owners of White King), want to provide their customers with more choice in highly effective household cleaning products by providing a bleach free option. They asked us to take a look at the packaging for new White King Bleach Free. We wanted to capitalise on existing brand equity but also allow the new bleach free range to be instantly recognisable as something quite different to the core range. Thinking back to the family laundry growing up, White King was always front and center. The cupboard above the washing machine (top loader back in the day of course) was full of products like Omo, Softly, Martha Gardena’s, Fabulon (makes ironing easier) and of course the red on white bottle of White King for heavy cleaning and stain removal. So it was with a touch of sentimentality that we took on the challenge and started working with Pental brands on the packaging for White King Bleach Free. The first step with the bleach free packaging was the bottle shape design and colour palette. To give it a less clinical and more lifestyle feel, we were keen to break away from the White King typical white opaque bottle, as a bottle without showing its contents, suggesting a powerful bleach hidden away inside. We felt that a clear bottle and good liquid colour was a better choice for a bleach free concept. Natural images of sliced lemon, limes and an ocean wave, paved the way to a new fresh and friendly White King product variation. And we evolved the iconic red shield to an ocean blue background while retaining the iconic shape and typography. With a matching blue trigger for the bleach free range, it’s been designed for a good colour splash of ocean blue giving it extra shelf pop. The White King Bleach Free is on shelf now. We’re looking forward to seeing how consumers react to a new bleach free option.